Australia is not Hollywood. Australia is not Hollywood. Australia is not Hollywood. Sometimes, I have to remind myself. It's the only way to preserve my sanity. See, I'm an independent film producer who's been involved in the film industry since before I was a teenager (over 20 years now, eeesh!). And because I grew up in Los Angeles, the film industry was all around me. It never even occurred to me that people might consider a career in film "impossible". So when I got to Australia and started looking for screenplays, I was genuinely surprised by how few people were doing it. At first, I saw it as a tremendous opportunity. Over time, I began to realize it was a tremendous obstacle. As it turns out, many Australians who WOULD turn their ideas into screenplays DON'T... simply because they don't think it's feasible. 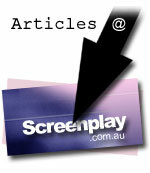 If you can excel at screenwriting in Australia, you can get noticed. The local industry is continually crying out for quality material. Why shouldn't it be you that writes it? But Australia is not Hollywood. So the career path of a screenwriter here is not quite so obvious. That's why I've identified five different and clearly-marked paths that would-be Australian screenwriters can take. I don't know if these are the ONLY paths, but they're the five that I could identify without much thought. If you're looking to write a screenplay, pick a path and write FOR it, and your chances of seeing something in return for your efforts will multiply exponentially. It's no secret that government funding dominates the Australian film industry. And many would-be screenwriters see government money as the only source of income. It's not, but it's the most obvious. To attract government funding, you'll need to understand what those funding sources need to see in a screenplay (specifically, cultural relevance). In Australia, most of the competition is writing for this market, but it remains alive and well). Australian producers exist in a difficult environment. They typically have very little script development money, and can't claim development expenses against their taxes unless the project goes into production. The result? Films get pushed into production prematurely. Australian producers aspire to make brilliant films just like everyone else does. To write for this market, research who's who, who does what, and what they're looking for. Craft something powerful that's specifically designed for them, and you'll get noticed very quickly. Partly from a do-it-yourself attitude, and partly from the necessity of surviving in a small market, many writers aim to self-produce their work. If this includes you, you'll need to learn the myriad other skills involved, which will necessarily limit the time and energy you can put into perfecting the screenwriting craft. Be sure to get objective feedback on your project before racing into production. Most writers misunderstand self-producing, assuming it's the easiest (or at least most direct) route to a completed film. In fact, it's about twenty times the work for half the reward. But it's a viable avenue that can be legitimately considered. Although I'm technically just one of the many producers who fall under category 2, I'm a little unique down here, in that I believe in applying "Hollywood" techniques to local stories. My philosophy is simple: If you make movies that make money, you get to make more movies -- so let's start making mainstream entertainment that can keep the quality industry alive. Many in the local industry reject that kind of American influence, arguing that Australian film should be pure and free of commercial considerations. It's a valid point of view, and I absolutely respect it. But I want to reach out to the cineplexes, so I seek "High Concept" stories that can be easily marketed to a wide audience. There are several Australian producers with this philosophy, and we all fit into this category. Yes, believe it or not Aussie screenwriters, despite being this far away, writing for the Hollywood market is a legitimate and viable path. Ironically, many Australian writers have found it easier to "break in" to the Hollywood market than Americans. Largely the result of very few Australian films getting released in the US (and then, it's only the good ones), Hollywood has a distorted perception of Australia, and makes assumptions in your favour. The challenge to this path is that, in the end, you're competing with about 100 times as many writers, including the best in the world. Your skills had better be world-class, if you hope to compete. So. Which path is best? The simple answer is that there's no answer to that question. It's whichever is right for you, your project, your personality, and your goals. Don't rule out -- and don't settle for -- ANY of these, simply because they look easier or harder than the others. The point is not which path to take. The point is that there are at least five real, potential, viable career paths for Australian screenwriters. So if you've got an idea for a screenplay, or you have any inkling that screenwriting might be something you'd like to do, I strongly encourage you to consider it seriously. Australia needs quality screenwriters. We make 30-odd films per year, on average. If every one of them was amazing and powerful, or far-reaching and entertaining, the local culture would flourish.